Personal injury and wrongful death attorney Tim Salvatore sees many clients after they have been involved in car accidents. Too often, these car accidents are preventable. Lately Tim has been thinking about the topic as he is teaching his teenagers to drive. Below are some of his thoughts on the most common driving mistakes and the simple measures people can take to drive more safely. What do you see as a top driving mistake? Following too closely. You may be a great driver. But what happens when you are following another vehicle so closely that you can’t even react in time to touch the brake before hitting the car in front of you? A safe following distance is two or more seconds behind the lead vehicle. When the rear of the vehicle in front of yours passes a fixed object — a line on the road, a sign post, a tree — start counting 1-1,000, 2-1,000, or 1-Mississippi, 2-Mississippi. The front of your car should not pass the object until you finish 2-1,000, or better yet, 3-1,000. Keep in mind your stopping distance includes the time it takes you to react to the need to stop, the time it takes you to step on the brake and start slowing the car, and the time it takes the car to stop under full braking. What are some other mistakes you often see? 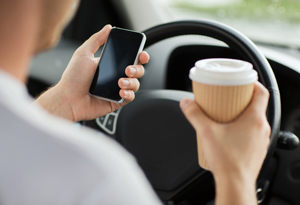 Distracted driving (daydreaming, texting, talking, eating, yelling at kids … ). This prevents you from reacting to traffic and road conditions in a timely manner. A mother with a cellphone at her ear driving a minivan full of kids chomping on burgers from the fast-food joint is just plain scary. The best rule to follow is this: When driving a car, drive the car. Over-riding your headlights at night. If you can’t stop within the distance that your headlights illuminate the roadway at night, you’re traveling too fast. You can’t react to something that you can’t see. That might mean traveling slower than the posted speed limit. Driving too fast for conditions. Rain, snow, oil and cold temperatures can dramatically increase your stopping distance. Slow down to prevent car accidents. Not cautioning other drivers if you’re stopped. If you are the last vehicle in a line of traffic stopped near a lane of traffic that is continuing to move, then use your emergency flashers or tap your brake to activate your brake lights and alert other motorists to the presence of stopped or slow-speed traffic ahead. Entering turns too fast or turning too early. The proper way to enter a turn is to perform all necessary braking before entering the turn and then accelerate out of the turn. Braking once you start to turn is a recipe for losing control and entering other lanes. Unless you’re towing a trailer or driving a long wheelbase vehicle (like a bus), it isn’t necessary to enter the oncoming lane in order to set up properly for your turn. Roadways are designed so that the majority of vehicles on the roadway can make a safe turning movement within a lane of travel. A particularly common error that many drivers make is turning too early, which results in an intrusion into other lanes of travel because their path of travel is more shallow than the turn itself. Often, accidents occur at intersections. Do you have any tips for how drivers should proceed at a stoplight? If you’re the first car at a stoplight, pulling out immediately after the light turns green is dangerous. Always plan on other drivers running red lights. The safest way to proceed from a stoplight is to simply count 1-1,000, 2-1,000, and then pull out. On highways, such as Route 30 and I-83, changing lanes and yielding tend to produce accidents. What is the proper way to yield? Drivers should never stop on on-ramps equipped with a yield sign. Instead, they should start looking for an opening in traffic by moving at a slow speed up to the first possible merge point, identifying an opening, and using the remaining ramp to reach highway speeds BEFORE entering the highway. If you or someone you know has been involved in a car accident, call on our team for help. Contact Tim or another one of our skilled attorneys 24/7 for the Results You Deserve®.